Some clients are curious about what services they “need” and through time link readings, many areas are covered. Time link is also the ability to look at the present and how to move into the future. It helps us move through obstacles to achieve what our guides want for us; a divine life while here on earth. “When tuning in, I have the ability to exchange energy and share messages through your guardian angels, spirit guides and past loved ones. However, the choice is yours who you allow to come though that gate. Readings are a mutual agreement to exchange energy. If you are closed, the messages are hidden and the exchange is dulled by your block. My awareness of energy and how to move through the struggling emotions puts the receiver at ease. You will find comfort in my compassion. On occasion, I use a pendulum which is a tool of divination used to confirm clear communication energy between the higher guides and the human energy. A pendulum merely triggers a clear line of communication and confirms the connection. Questions and answers flow more easily to open the gate of love and light between the giver and receiver of messages. The bottom line is: This is Spiritual Energy work. As a clairvoyant and when we connect, we can determine your needs”. “Last, I am telepathic and information flows to me through your spirit guides, guardian angels and all who walk with you on your journey. These energy connections to your aura share imagery similar to “looking through a view finder”. I have the ability to perform energy work of cleansing, clearing and protecting your energy while we have a session”. Brandie has a beautiful gift of healing the past and revealing the future through spirit guides, angels, past loved ones and intuitive automatic writing. “My name is Brandie Wells, Compassionate Clairvoyant. I am an Angelic Healer, Clairvoyant & Psychic Medium. As a world renown Psychic Medium and Co-host of Soul Central on ASK1Radio.com, I have expanded on a global level. Listen every Tuesday at 9:30pm est. Time link© is the ability to look back and tap into past life energy and mediumship. Mediumship is healing, revealing and creates closure as messages from past loved ones are translated. My ability to see the energy body; both spiritual and emotional bodies, is what I call verbal reiki. I align your soul. I see the chakra energy system and aura energy as I tune in for messages.I acknowledge your low vibrations or stagnant energy through verbal messages which brings a clearing to raise your vibrational energy to a place of manifestation and abundance. It is not my mission to make anyone a believer. I like to open individuals to the reality we are all energy. Our spirit is on a journey. This vehicle, the human body, is temporary. Energy can not ever truly dissipate, but it can move, split and divide”. I walked in a sceptic and walked away a believer. There was nothing vague about my reading. I asked if there was a message for someone in particular and the answer was immediate and definite. I am planning on doing this again. I highly recommend Brandie. Brandie is on the mark, a kind and compassionate soul. Her ability to pick up on and provide detail is extraordinary and healing. I shall seek further guidance when the need arises. I always feel so much better after a reading with Brandie. She is enlightening, compassionate and truly cares about what she is doing. You instantly feel like you have know her all your life and you are just talking to your best friend. A reading with her in never long enough but always so helpful, welcoming and eye opening. I can’t wait to go back and talk more. Thank you Brandie for what you do. What an amazing experience. I was able to talk to me grandmother who I had so many regrets about, and my unborn son. She blew me away when she spoke of my grandfather and him having heart failure. There was know way she could have known that! Truely worth going to meet. I can’t wait to go again. I have had readings 4 times now with Brandi. Love her, she is very honest, kind and accurate. One of the encounters was at my home for a “Psych Party”, not one of the guest was disappointed. I have always trusted Brandi with her guidance. I was invited to a Spirit Circle with Brandie. She is a very kind, compassionate person. I have to say I was overwhelmed with how accurate she was. I went home and booked her myself. Looking forward to it! “Skype, Phone & Online Messaging Readings flow easily for me. This is a psychic reading through Skype(preferred), phone or Facebook messaging. Your guides show me your path and I share the information. With Facebook messaging, you can look back any time. Like my FACEBOOK page “Brandie Wells Compassionate Clairvoyant“. “Brandie offers paranormal investigation event in New England. She firmly believes we are the same when we pass into the spirit realm & these souls have a message. 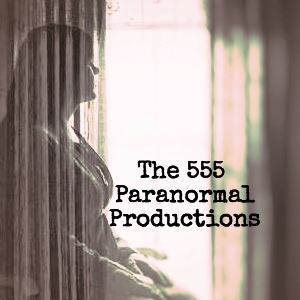 Brandie is the owner of THE 555 Paranormal Productions. “A1R producers have over half a century of professional & very successful radio broadcast experience. We have the call letters of some of America’s most iconic radio stations on our resumes. Plus, and more importantly, we operate from the light with love and an open, honest heart for each client. This helps us create shows that inherently give birth to their own powerful, viral word of mouth. A1R Psychic Radio is unlike most of the metaphysical “radio stations” on the web. To be honest, many can be kind of shady. Some are even run by people who have barely stepped foot inside a real radio station & have never worked at one. We’ve even seen stations “associate themselves” with iconic events/establishments like The Rock & Roll Hall Of Fame, big broadcast companies, famous psychics/celebrities they don’t work with and even the Oscars, all to mislead light-workers into believing they have credibility they don’t have. We have even seen stations attempt to steal our identity. “Brandie Wells, Compassionate Clairvoyant, is known for her various clairvoyant abilities. She is a Psychic Medium, Animal Communicator, Angelic Reader & Healer, Palmistry Teacher, Fairyologist, Paranormal and Cold Case Investigator & Event; Party Planner. She owns a business in the heart of downtown Keene, New Hampshire, USA, known as Keene Intuition. Brandie is a hub to spiritualist all over the world. She has a strong sense of community and enjoys networking. 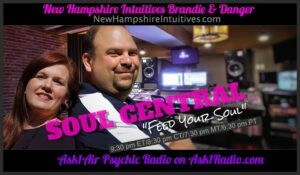 Soul central introduces the audience to “what feeds the soul” by exploring various forms of divination, wellness and spiritual enrichment. Each week, a guest will be showcased, exposing their talents and abilities. The audience will be captivated by the variety, fulfillment and joy in learning. Due to the privacy of Cold Case Files, no information is available on current cases. Brandie is a trance channeler. She tunes in to a case and reveals answers. Trance Channeling is a form of mediumship. The other incarnation of non-physical mediumship is a form of channeling in which the channeler goes into a trance, or “leaves their body”, allowing a spiritual entity to borrow their body, who then talks through them. EMAIL BRANDIE to be hired for a case.